Our classifieds database consists only of Porsche 911 cars, our blog only treats content related to the Porsche 911 and our visitors are all inherently passionate about the Porsche 911. We do not talk about about any other Porsche model, nor any other car brand. Where traditional online marketplaces make no distinction between brands, 911 Vintage will go the extra mile to add detail to its classifieds database, simply because most of our visitors are not looking for just any Porsche 911. By enabling visitors to search for the car they really want, we aim to enable a faster and more qualitative sales transaction. It's easy to get lost in the archives of the Porsche 911, yet some Porsche 911s are worthy to single out. Some Porsche 911s are extremely rare, such as the 1974 Carrera RS. Easy. Other cars are perhaps less rare but could be offered in an absolutely immaculate state. This is why each of our classifieds receive a rating (1-5 stars) for rarity, value and overall condition. 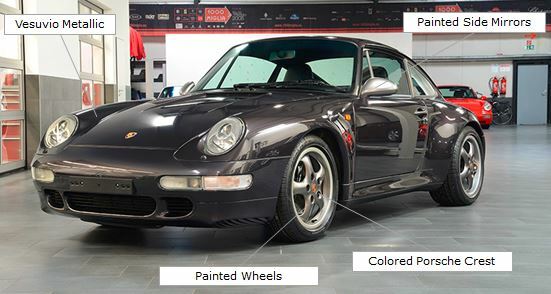 Our database contains more than 150 different colors that have been available for the Porsche 911 since launch. We make a distinction between 'standard options', be it leather seats or a sunroof, and 'purist options', such as a clubsport roll cage or paint-to-sample colors. And if you cannot find your spec detail, we will add it for you. These are just a few examples of the attention to detail used when creating our classifieds database. The first classified advertisement is free. If you are looking to sell your beloved Porsche 911 then you can upload your car absolutely for free. If you are selling more Porsche 911 cars, either on personal title or by representing a car dealership, then we have a number of business packages on offer that will enable you to upload multiple cars in one account. Promote your car on our home page, through a classified highlight or on our dedicated Porsche 911 fan page on Facebook. Contact the 911 Vintage team for more details. We are happy to give exposure to your business if this enables quality content for 911 Vintage visitors, because the more knowledge we can share about the Porsche 911, the better. With your support we aim to further constitute the 911's legacy as the world's most appreciated sports car. Get connected and sell your Porsche now!